DON'T BLINK wrap around solid .925 sterling silver band ring. 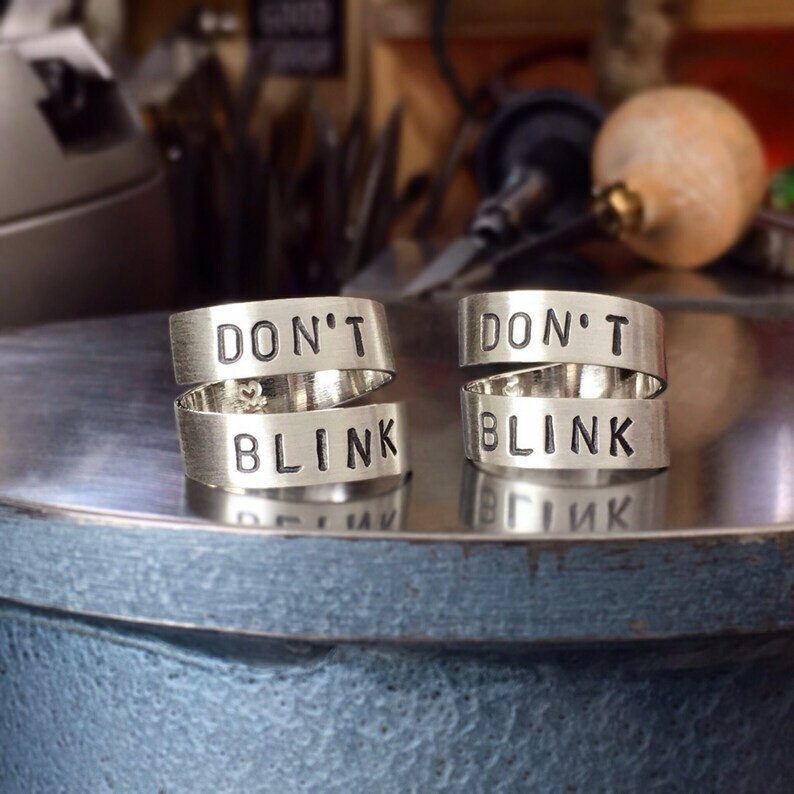 Don't Blink ring. Sterling Silver Dr. Who band ring. Whovian ring. Inspired by the Dr. Who episode, "Blink" featuring the Weeping Angels. .925 sterling silver, hand sawn from a sheet of 20 gauge (.81mm) sterling silver and hand stamped with your requested quote. I then anneal the metal and shape it into a wrap around ring. Once formed, I oxidize (darken) the letters and texture the surface with a brushed matte finish. The inside of the ring is polished to a smooth, shiny surface with a contoured edge for a more comfortable fit. My hallmark, the chickenheart, is stamped inside the band alongside a .925. These stamps guarantee that your ring was made by me, tinkerSue, and that the metal is .925 solid sterling silver. Please allow 1 to 2 weeks for me to create yours.